Festival Report - Radhastami Celebrations! ~ The Toronto Hare Krishna Temple! Festival Report - Radhastami Celebrations! Radhastami Celebrations Captivate Devotees' Hearts! On Monday, September, 21st the Toronto Hare Krishna Temple celebrated Radhastami which is the appearance day of Srimati Radharani. Radharani is the female counterpart of Lord Krishna, and She is the embodiment of feminity in nature. In a countless number of temples around the globe, devotees gathered to celebrate this auspicious day and wish Radharani a very happy birthday. 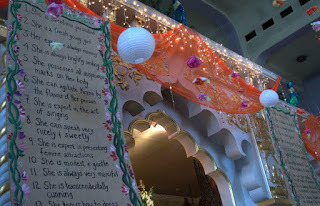 The Toronto Hare Krishna temple also took part in the celebrations with guests from all over the world, including the US. During the evening festivities, there were many highlights. Namely the lecture given by Mother Praharna highlighting some of the wonderful past times and qualities of Srimati Radharani and Krishna. Following this lecture, the devotees who were assembled were engaged in an uplifting kirtan glorifying Radharani. As the kirtan was going on the festivities reached a climax with the annual tradition of opening of gifts for the Deities. All throughout the evening devotees from all around, brought in wonderful gifts for Radharani. With the kirtan playing, each gift was carefully revealed by the pujaris (priests) to the eager crowd of devotees. The gifts ranged from household items for use in the temple kitchen, to opulent necklaces and tiaras for the Lordships Sri Sri Radha Ksira-Chora Gopinatha. After the gift opening ceremony, there was a closing kirtan with a stunning aarti. Their Lordships Sri Sri Radha Ksira-Chora Gopinatha bedazzled all the devotees in their gorgeous flower outfits. The aarti was then followed up a sumptuous vegetarian feast that all those gathered got a chance to enjoy. 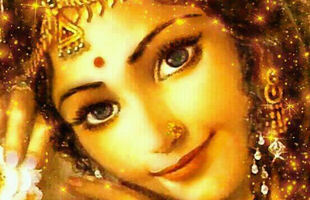 All in all, this Radhastami was one of the most exciting and enlivening spiritual experiences. All those who were gathered got a chance to truly experience all of the wonderful qualities of Radharani.